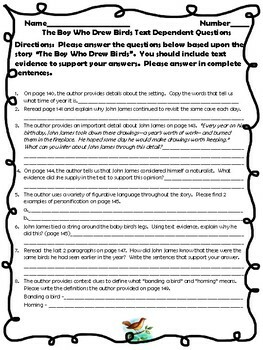 This is a set of text dependent questions that correlate with the McGraw Hill Wonders story from Unit 2, Week 3 - "The Boy Who Drew Birds". 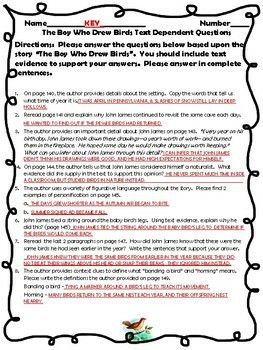 I have created a set of questions that will require students to delve into the text to find the answers to each question. A variety of skills are assessed through the questions. Figurative language, inferencing, context clues are just a few of the skills addressed in this activity. I have other activities that correlate with this story. Please check them out and remember to leave feedback to earn your TPT credits! Thank you for considering my products.